Three of the top reasons why Guadeloupe islands vacation spots are awesome French Caribbean holiday spot includes exciting sailing experiences, fun whale watching activities, and amazing island hopping adventures. This vacation spot is shaped like a butterfly with two major sections. The two main sections are called Basse-Terre and Grande-Terre. On the southern wing of this butterfly shape territory is Basse-Terre while on the northern shape is called Grande-Terre. Basse-Terre is where you will find some of the top attractions on the island while Grande-Terre you will find the commercial center of the island. Guadeloupe main airport is located in Grand-Terre called, Pointe-A-Pitre. Guadeloupe is the largest French dependent territory in the Caribbean. There are some amazing small French Caribbean islands and islets just off the coast of the territory. These groups of small islands are often referred to as “The Pearl of the French West Indies.” Marie-Galante, La Désirade, and the Îles des Saintes are three of the islands the make up The Pearl of the French West Indies. Guadeloupe is located north of Dominica, and south of Antigua in the Eastern Caribbean. It also situated south east of Puerto Rico. The is one of the top French Caribbean island that is excellent to spend your vacation all throughout the year. This resort is located in Grande-Terre around the commercial center of the island. Mgallery Auberge De La Vieille Tour allows visitors to get panoramic views of the neighboring islands. Moreover, the hotel is close to the airport which will aid visitors reaching their destination in a short space of time after reaching the island. Although the resort has many activities for guest to participate in you will find that the more interesting Andrea fun filling options are nearby the resort. Some of these activities include boating, wind surfing, sailing, snorkeling, water-skiing, scuba diving, golf, and fishing. It is one of the locations on the island that there is no language barrier because of the multilingual staff. Guadeloupe Island resorts is one of the spots that provide great opportunities to enjoy a French Caribbean Island vacation. La Plantation Resort is another of the top Guadeloupe vacation spot situated in Grande-Terre. It is one of the locations that is excellent French Caribbean family and romantic vacation spot. Vacationers to this resort will have a lot of activities they can engage in close to the resort. Some of the unique activities include helicopter and airplane tours, parasailing, canoeing, skydiving, parasailing, surfing, hiking, biking, scuba diving, motorized watercraft and golf. Moreover, this resort also provides great options for family and romantic vacations. Romantic couples and singles will lovely the spa treatment facilities which offer services such as facial, massage, body wraps and scrub treatments. Guadeloupe vacations are excellent and this is one of the top luxury Fench Caribbean resorts that offer great holiday options. Another of the top resort in Guadeloupe that is located in Grande-Terre is The Hotel Eden Palm. It is a popular hotel for family vacation. The location provides excellent opportunities go horse riding and playing tennis. There is also the opportunity to go scuba diving. Some of the facilities you will find at the location include outdoor swimming pool, steam room, gym, beauty center and garden. These are excellent places that will help you to relax on your vacation. In addition, there are child care services and banquet facilities that are available for large group celebrations. Moreover, the friendly multilingual staff will ensure that your stay are the resort is really rewarding. Guadeloupe vacations are wonderful and this is one of the resort that will allow you to enjoy yourself in a French Caribbean Island setting. This is one of the top Guadeloupe hotels on the southern section of the territory of Basse-Terre. It is considered amongst the top three hotels in the island. This Guadeloupe resort is excellent for family, groups, couples, seniors and singles vacation. The location offers children under the age of sixteen the opportunity to use the same bedding with parents to stay free. Moreover, because the resort is located on the southern section on the territory there are some great opportunities to enjoy many of the island top natural attractions. Additionally, some of the activities visitors will find fun filling that they can participate in close to the resort are sailing, running track, horse riding, rafting, rowing, whale watching, golf, snorkeling, skydiving, fishing and sailing. Guadeloupe Caribbean vacation are great for water sports and hiking adventures. The La Toubana Hotel and Spa is a four star Guadeloupe hotel on the Grande-Terre. There are thirty-two lovely beach and garden suites at the location that are excellent for any form of romantic Guadeloupe vacation. Romantic couples will get opportunities to go on Eco-tours, whale watching and windsurfing. There is also a friendly multilingual staff at the resort along with excellent gym and spa treatment facilities at the resort. Guadeloupe vacation spots are amazing for romance and this is one of the resort that will allow couples to enjoy this opportunity in a French Caribbean island. The location of Guadeloupe makes it an excellent place for visitors who love whale watching adventures. Guadeloupe is situated just a few miles north of Dominica which is the top whale watching destination in the Caribbean. This allow the island to provide some excellent opportunities to go whale watching during the period November to April which is the best time of the year for whale watching. The Sperm and the Humpback whales are two of the main species of whales that are often spotted in the territory’s waters. Conversely, the island provides most of the best opportunities to enjoy nature in a French Caribbean island. Guadeloupe vacations are often centered around it eco-tourism attractions which are mostly on the southern section of this butterfly shape island. Basse-Terre has many lovely waterfalls and hiking trails for those visitors who lovely these types of adventures. Moreover, this section of the territory is one of the best places to go camping. This location has a National Park and its home to the island active La Soufriere Volcano. This is National Park is one of the lovely feature on this French Caribbean island. Guadeloupe is a territory that is comprised of many small islands and islets. The provide lovely opportunities for visitors who lovely sailing adventures. Moreover, because of the closeness of the islands sailing adventures can be really fun filling with visitors having the options to go island hopping on the different island in a one day tour. Some of the islands that make up French Pearls that you can visit are Marie Galante, Dominique, Petite Terre, and Les Saintes. In addition, there are opportunities to scuba dive, sunbathe and snorkeling while on these sailing adventures. 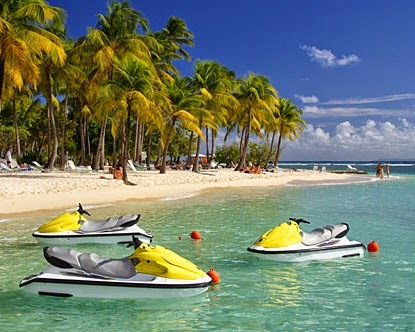 Guadeloupe vacations are just excellent places to enjoy a French Caribbean island experience. It is a place that provides great opportunities to go whale watching, sailing, horse riding, skydiving, hiking, ecotours and scuba diving. There are some lovely resorts on both sides of the territory that give great opportunities to enjoy the island attractions and sporting activities. Additionally, the territory is easy to get to from international gateways in North America and Europe.